The Marketing and Communications Office is responsible for publicizing and showcasing the diverse array of programs and services sponsored by the Division of Student Affairs, affiliated student organizations, and campus partners. 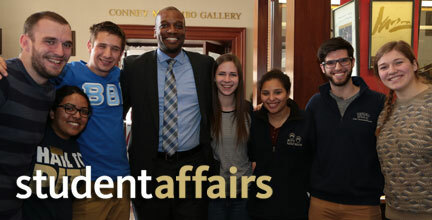 The office collaborates with each department within Student Affairs, as well as students, staff, and faculty campus wide, to develop and implement creative and comprehensive marketing strategies. We strive to ensure that students, faculty, and staff are well informed about programs, events, and services that enrich the student experience. A variety of print and digital platforms are used to develop and execute effective marketing campaigns. OUR MISSION: To creatively and effectively assist Student Affairs staff and student leaders, and University partners, in promoting their programs and services by utilizing an array of multimedia marketing and communications tools. Please initiate all project requests by using the project request form. See below for some helpful guidelines to working with our office. Janine Fisher, director of marketing and communications. Janine is in her ninth year working in the MC Office, and 16th year as a staff member at Pitt. Janine is a proud Pitt alum and manages the day-to-day operations of the department, including playing a lead role in developing and implementing a variety of strategic multi-media marketing campaigns. Janine can be reached at jsf10@pitt.edu or 648-1049. Megan Speakman, assistant director for creative services. Megan recently joined the MC team, starting in this new position the Monday of New and Transfer Student Orientation Week. Megan is responsible for managing graphic design services for the division, as well as overseeing strategic branding. She previously performed design services for Charlotte Parent magazine, before moving back to her native Pittsburgh. Megan can be reached at mek187@pitt.edu or 383-0445. Adam Gaus, assistant director of marketing and communications. Adam is in his fourth year as a staff member in the MC Office, after serving for more than two years as a student intern in the office, Adam is on track to earn his MBA from Pitt in December. He uses his expertise to develop effective digital marketing campaigns, using creative social media strategies, the 32 TV screens within Student Affairs, Web sites, and videos to help promote programs and services. Adam can be reached at adg54@pitt.edu or 648-5101. Samantha Gatesman, marketing specialist. Sami is a new addition to the MC team this year. Although she isn't a Pittsburgh native, she has always dreamed of living here. She is responsible for online distribution of Student Affairs marketing campaigns including social media support, digital signage, and the Campus Connections newsletter to communicate information to Oakland students. Sami can be reached at sjg84@pitt.edu or 383-2122. Let the reporter or writer know that all requests for interviews with Student Affairs staff members must be coordinated through Janine Fisher, Director of Marketing and Communications. Please ask the reporter to e-mail their questions to you and Janine (jsf10@pitt.edu), and to let us know what their deadline is. We want to accommodate the media as best we can in a prompt and professional manner. If you have a program, event, service, or messaging campaign for students – and require the support of the marketing team for design of promotional materials such as flyers, slides for TV screens, videos, or event coverage – you are required to initiate the project with the Student Affairs Marketing and Communications Office. Please utilize the new project request system to contact Janine Fisher and begin the process of developing marketing strategies and production of promotional materials. The Marketing and Communications Office has launched a new project request system (online form). This is a tool to streamline the request process to reduce the amount of back and forth e-mails. By providing the MC team with as much information as possible on the front side, we are able to see the whole picture of your request, and really get to work quickly instead of having to send multiple follow up e-mails for information. As always, we are open to a conversation about your event or service, our goal is to help you succeed. Pitt Portal – Our weekly newsletter will be posted on the portal each week. Additional requests for content to be posted on the Pitt portal can be submitted here. PittWire Calendar – This University-wide calendar is connected to the daily electronic newsletter produced by University Communications. Enter information here. The Pitt News/SGB student events calendar – View here. Note: Materials that we produce are distributed to Student Affairs staff and student leaders including, RAs and First Year Mentors. Materials are also sent to news media outlets, including The Pitt News, WPTS Radio, and the new PittWire, which is sent electronically each weekday during the semester to faculty, staff, and students. If you reserved a room through EMS, you will have the option of selecting whether the event is open to the undergraduate student population, or closed. If you select open, then your event will automatically be populated into the calendar and it will appear on events.pitt.edu. Choose an appropriate title for the event. Listing the event as “Monthly Meeting” does not provide enough info. Listing it as ”XYZ Organization Open Meeting” is better. Please provide a quality one or two sentence description of the event. Remember, whatever you enter, the general student population will see, so if you want to draw people to your event, please provide a quality description. Typing “none” will advance you to the next field, but won’t help you achieve attendance goals. Please select the OCC goal area for the category in which students can receive credit. In doing so, your event will now be publicized on the OCC events calendar as well. If you automatically select “does not receive credit,” then you are missing an opportunity for publicity. If you do not need to reserve a space through EMS for your event, but still would like it to be included on the Student Events Calendar, please visit www.events.pitt.edu. Click on ‘add event’—light blue text at the top of the page. This is a little hard to find if you don’t know where to look—it’s directly underneath the ‘month’ text at the top of the page. Fill out the form, including an appropriate title, description and OCC category (see above). Once submitted your event will be viewed by an administrator to be added to the Student Events Calendar. We look forward to working with you to develop creative and effective visual materials to promote your event, program, or service. Our goal is to ensure quality branding for the University, the division, and your respective office. Here are some guidelines to keep in mind when submitting design requests. For materials that were produced previously by our office and only require minimal edits—requests should be submitted two weeks in advance at a minimum for printed flyers, posters, and foam boards. For more extensive requests and new projects involving printed brochures, banners, “swag” material, t-shirts, and full marketing campaigns, please allow at least one month turnaround, to ensure there is time for concept development, approval and printing. New concepts and ideas for visuals are encouraged, but please be mindful of the complexity of the idea and the time constraints. All text should be submitted at the time of the request as an MS word document; you are able to upload files in the project request system. Nothing will be sent to print or displayed digitally without final approval from the client. Please make sure you are proofreading thoroughly for typos, grammatical errors and inconsistencies. New templates have been designed to assist you in developing quality PowerPoint presentations. They can be found on the division’s shared drive at: SA Shared—Divisional Information—Department Logos and Marketing Info—Power Point Templates. If you would like a custom title slide for your department please utilize the new Project Request System and work with Janine. The University of Pittsburgh requires all divisions, departments, programs, services, and staff to utilize standardized letterhead and business cards. The University does not permit customized letterhead or business cards. Therefore, all Student Affairs departmental electronic letterhead can be found at: SA Shared—Divisional Information—Department Logos and Marketing Info—Letterhead. If you need to print letterhead, please coordinate with Megan Speakman, assistant director for creative services (mek187@pitt.edu, 3-0445). All University business cards should be ordered through the Department of Communications Services here. Student Affairs departmental logos can be found at: SA Shared—Divisional Information—Department Logos and Marketing Info. Specialized logos, icons, badges, and wordmarks can be developed for programs and services (not departments) by contacting Janine. Place the icon in the top right corner of printed flyers, digital TV screens, and all other advertisements posted online or on social media outlets. The icon is 1.5” in width and height. Retain this size on all advertisements. When placing, the icon’s edge should be a minimum of 0.25” inches from the top and right margin of the page. Keep goal area icon separate and not overlapping or under other text. Please contact Amy Lavallee (amy.lavallee@pitt.edu), 8-7142) to make arrangements for OCC credit. In order to be in compliance with University and Student Affairs usage policies, please coordinate ALL use of the Pitt Script logo with Megan Speakman, assistant director for creative services (mek187@pitt.edu, 3-0445). For a full list of graphic design services, please see the online submission form. As a reminder, each unit and major program is responsible for updating and maintaining pages on their respective Web sites. Content should be reviewed and updated on a regular basis to ensure accurate information is being presented. If you need support or training, please contact Janine for assistance. If you wish to promote an event or service on your departmental Web site, please indicate that you wish to have a Web slider created as part of your project request. Departments and programs have the autonomy to manage their social media accounts, with limited restrictions. Please use professional discretion in what you post or re-post, and do not live tweet or post during an event without prior communication with the program manager and Adam. We encourage cross-promotion of events and services throughout the Division. Look for a message from Adam once per week with content that the Division would like to cross-promote on our various social media accounts. If you would like a profile picture/cover photo developed, please indicate it on the marketing project request form. Account managers should refrain from creating new hashtags. Using long-standing, well-established hashtags can help you to promote your program and gives credibility to your program. Creating a unique hashtag is usually not an effective way to promote your program because it takes a considerable amount of time to gain a respectable following. This list is not all inclusive. If you have a well-established hashtag, please let Adam know and we will update this list. There are a variety of types of videos that our office can produce. All video and photography requests can be made through the project request form. Here are a few tips for working with us. Know the purpose of your video. Capturing footage, “just because” does not usually result in quality productions. Pay attention to lead times. The more elaborate your production, the more lead time you will need to give. Animations take a large amount of time in production, but event coverage can happen in moments. Concepts and ideas are encouraged – Bringing an idea to the table for your video can be very helpful, just be open to changes as sometimes time constraints and other factors do not make all ideas viable. Know who needs to review a video – If you request a video and are the only one who needs to approve it, great! But if it needs to be seen and approved by others before being sent out, please make sure they are involved in the project beforehand. Often times they will require edits that will factor into production time and completion. At most events, signs will be posted announcing photography and/or videography is being taken. It is up to the individual to let the photographer and/or videographer know if they do not wish to be photographed or videoed. For staged shots and video interviews individuals will be asked to sign release forms allowing their images and interview to be used by the Student Affairs Marketing and Communications Office and/or the Department of University Communications. A videographer will attend event and capture footage to be used at a future time. There are a variety of types of photography that our office can produce. It is always beneficial to have a goal or purpose when asking for a photographer. This can help determine what style and type of shot the photographer produces. All video and photography requests can be made through the project request form. Here are some common types of photography we produce. A photographer will attend your event, service, or activity and capture photos to be used at a future time. They can be taken at an event or in a scheduled time in our studio. Headshots include photo retouching as well. These shots require a pre-meeting to discuss what the goal is, any props that will be needed and what equipment will be required. Editing of the photos can be done after the fact as well. Select photos from events will appear on the Student Affairs’ Flickr Page, which is an online collection of photo albums chronicling Student Affairs events. They can be found here. Creating or logging into an existing Yahoo Account will enable you to download select photos. At most events, signs will be posted announcing photography and/or videography is being taken. It is up to the individual to let the photographer and/or videographer know if they do not wish to be photographed or videoed. For staged shots and video interviews individuals will be asked to sign release forms allowing their images and interview to be used by Student Affairs Marketing and Communications Office and/or the Department of University Communications. Please visit our online request form.